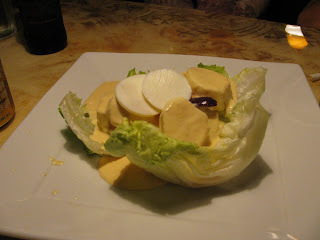 This "Causa Limeñisima" looks like the fussified creation of a 1980's nouvelle cuisine chef, but a causa is a very typical Peruvian dish. It seems rather unlikely - a cylindrical tower of cold mashed potatoes and avocado, topped with a crown of poached chicken or shrimp, dabs of mayonaise and slivered olives. 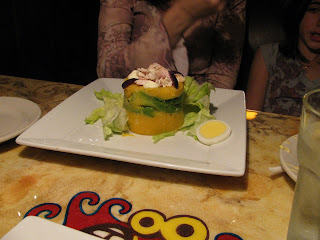 But the potatoes have a wonderful creamy texture that matches that of the avocado, their flavor enlivened with aji amarillo chile, with yet another layer of creaminess from the mayo. It's a dish that manages to be rich without being heavy, and was one of our favorites here. The Papas a la Huancaina didn't quite do it for me, though. Slices of steamed potatoes are topped with a creamy cheese sauce, which is supposed to be perked up by the delicate heat of aji amarillo chiles. But the chile heat was missing in action here, leaving this to taste like potatoes topped with watered-down Cheez Whiz. 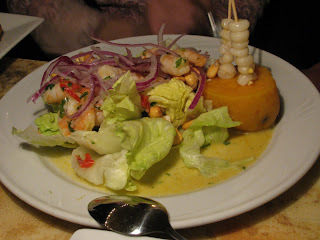 These Anticuchos Peruanos were better. 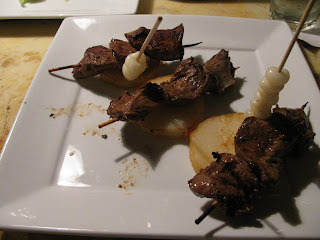 Though many Latin American cultures have their variations on anticuchos - which are, basically, meats on a stick - the meat of choice in Peru apparently is beef heart (corazon de res). These seemed to have been given a light herbal marinade before hitting the grill, and were served over rounds of roasted potatoes, crispy on the edges. These had a dense, rich meaty flavor; the texture is both smoother and more firm and a bit more bouncy than a steak, but not hugely different (the heart is a muscle, after all). These could have used some sauce for dipping. Indeed, I've been a bit like a junkie needing a fix since my local Peruvian chicken place, Edy's, with its fantastic green sauce, closed down (I think the magic ingredient was huacatay, a Peruvian herb with a unique flavor somewhere in the neighborhood of tarragon, mint or basil; it was either that, or crack). 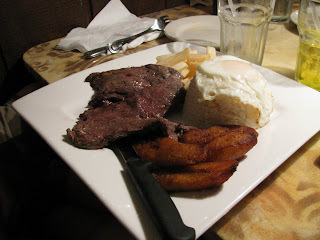 The Lomito a la Pobre was a thinly sliced palomilla-style steak, accompanied by french fries, maduros, and a mound of white rice crowned by a fried egg - simple, hearty and filling. It would have been better if served with tacu tacu, a mix of white beans and rice that is pan-fried until crispy on the edges. Arroz Chaufa con Pollo is a good example of the East/West fusion that characterizes so much Peruvian cuisine. "Chaufa," I believe, is a variation on "Chifa," which is customarily used to mean "Chinese-style." 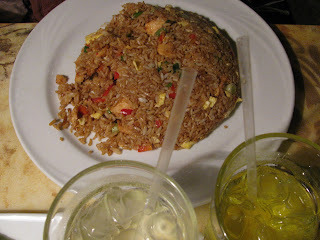 This is basically a chicken fried rice in a Sino-Peruvian style. The rice is heavy on green onion and red pepper, flecked with thin layers of cooked egg, and perked up with a bit of chile that gives a distinctly different, non-Chinese dimension to the flavors. El Rincón de Chabuca may not be the best Peruvian food in Miami, but it's a decent neighborhood spot and not a bad place to start sampling the variety and range of Peru's cuisine. And if it's not for you, you can still pay a vicarious visit to Uruguay, Argentina, Venezuela or Colombia just by walking right down the street. Thank you for your review. 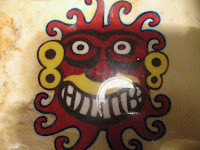 I've started a group, the Miami & Miami Beach Spanish Language & Culture Club, and recently visited this restaurant to consider it as a possible place for our group to explore Peruvian food. Please be sure to let me know if you join so I can add you to my list of high level advisors!